2010 Reinventing Minnesota -- Minnesota Community Pride Competition! Showcase Your Minnesota Community Pride This Summer! Co-sponsored by the Minnesota State Fair, MinnPost.com, and Minnesota Rural Partners, Inc (MRP), the “2010 Reinventing Minnesota -- Minnesota Community Pride Competition” opened for nominations June 1, 2010, and winners will be announced and cash awards distributed August 29 at the Minnesota State Fair. The contest is part of MRP’s Reinventing Minnesota initiative to recognize communities statewide for their efforts to move beyond the current economic challenge with creative and proactive community and economic development innovations. Minnesota Community Pride is an old-fashioned community improvement competition to reward, inspire, showcase and share the (re)inventive good work already going on in Minnesota towns and neighborhoods. Weaving through all submissions should be evidence of the Reinventing Minnesota motto: Connect, Create, Thrive -- citizen engagement, collaboration, innovation, creativity, imagination, problem solving, awareness, and information sharing. Special categories this year include Rural Urban Partnering and Youth-Led Community Engagement. Applications are due July 16.To download the contest guidelines and applications, scroll down to the information below that describes the two areas of entry: Category-Specific, and Comprehensive. Category-Specific Awards are for existing or emerging projects that fall within specific categories such as arts, broadband, entrepreneurship and more and take place in a community or neighborhood. Communities of all sizes are invited to nominate a project, including neighborhood associations within larger towns or cities. Comprehensive, Community-Wide Awards are for existing or emerging efforts in a community or neighborhood. In this community-wide improvement recognition contest, communities compete with other communities based on population size. The criteria mirror the 1980s Community Pride Awards process, which included evidence of citizen engagement in problem-solving, community assessments and planning, and action plans. Communities can generate submissions based on other community engagement, assessment and action models (e.g., Horizons, Healthy Communities, Value-Added Communities, etc.) or community-wide efforts that don’t follow a prescribed model. 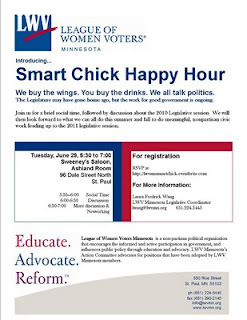 LWV-MN Introduces Smart Chick Happy Hour! We buy the wings. You buy the drinks. We’ll all talk politics! American Express NGen Fellows: Minnesota Connections! I took a cursory glance through this year's honorees for the 2010 American Express NGen Fellows Program and was delighted to find I knew a number of the Fellows. In fact, two of them live in Minnesota and another one has been here twice in the past year! MacArthur and I presented at the same Minnesota Campus Compact conference this winter, Jennifer and I co-chair the Citizens League Communications Committee, and I spoke on a panel entitled, "The Next Minnesota Miracle," regarding a 2009 report that David's agency, the National Conference on Citizenship, released last fall announcing Minnesota as the most civically engaged state. I can chalk up these connections to the fact that it is a small nonprofit world, particularly here in Minnesota. However, I also consider this a great example of what will happen time and again as the rising generation continues to establish itself and take on critical leadership roles. This intentional network-building and the parallel efforts to identify and engage Minnesota's emerging civic leaders are part of the work Minnesota Rising hopes to be a part of in coming years. See below for more details about the 2010 American Express NGen Fellows and drop us a line when you're highlighted next year! The American Express NGen Fellows program gives emerging nonprofit leaders an exceptional opportunity to strengthen their capacity for future impact. Over the course of nine months, fellows collaborate with other talented under-40 leaders, interact with established mentors, and contribute to Independent Sector's work on nonprofit impact and leadership. MacArthur Antigua is director of national recruitment and expansion for Public Allies, where he has overseen both the growth of their national network to 21 cities and the highest numbers of applicants in their history. Prior to this position, he served as Program Director for Public Allies Chicago and led the development of Turning The Tide, an AmeriCorps Professional Corps/human services fellowship jointly managed by both Public Allies and the Alliance for Children and Families. Mr. Antigua is also the founder of Massive Creativity, a consulting and coaching firm that has provided pro-bono coaching for nonprofit executive directors and social entrepreneurs. He received his bachelor’s and master’s degrees in communication studies from Northwestern University. Jennifer Ford Reedy is vice president of strategy and knowledge management for Minnesota Community Foundation and The Saint Paul Foundation, where she is charged with driving strategy development and implementation. Since joining the Foundations in 2008, Ms. Reedy has guided two major ventures: GiveMN.org, a giving portal that raised $16 million from more than 40,000 donors in its first six months; and the Minnesota Idea Open, a platform created with Ashoka Changemakers to get Minnesotans talking about solutions to critical issues facing the state. Ms. Reedy was previously a consultant with McKinsey and Company and from 2003-2007 was “on loan” to direct the Itasca Project, a CEO-led regional economic development initiative in the Twin Cities. Ms. Reedy holds a master’s degree in social policy from the University of Chicago and is a Phi Beta Kappa graduate of the University of Kansas, where she received a national Truman Fellowship for Public Service. Independent Sector is delighted to announce the selection of the second cohort of American Express NGen Fellows. Over the course of nine months, these accomplished and innovative leaders will collaborate with other talented under-40 leaders, interact with established mentors, and contribute to Independent Sector's work on nonprofit impact and leadership. Works Progress is a network of creative collaborators based in the Twin Cities. Per their website, they "design multi-disciplinary events, programs and exhibits that inspire, inform and connect—fostering new relationships that cross creative and cultural boundaries." Among myriad other projects and efforts, they are responsible for Give and Take, Salon Saloon, and the West Bank Social Center. Two items in their recent newsletter (6.12.10) caught my eye and I wanted to make sure to highlight them. See below for some of their latest efforts and stop by their website or physical site to help out with their works in progress! 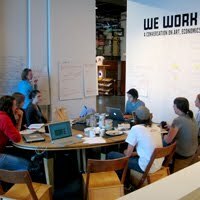 Help Wanted is a temporary employment agency that connects under-utilized creative energy to real community projects. Are you an under or un-employed artist, designer, or creative? Or maybe your 9 to 5 job doesn't tap into your creative assets or satisfy your desire for meaningful work? If either of these scenarios ring true, send us an email for more details, or just check out the schedule to your right and join us for one of the remaining work days. Please note: this isn't your typical volunteer gig. Each community organization we work with is ready to talk about the value of your work and compensate you with a unique trade. We're pushing everybody involved to think creatively about value, creativity, and community resources... and we'll do some really fun work while we're at it! Barter to complete your creative projects. Browse a kiosk full of ideas that need your skills, resources, space, or participation. Each idea proposes a trade, something the author of the idea has to offer in return. 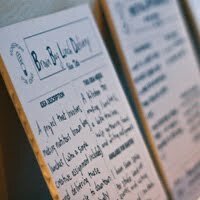 When you find an idea you think you can help complete, talk to our storefront clerk and he or she will help you make the connection. Currently needed for ideas in the storefront: Use of a kitchen, kiln, and screen press, web designers, 3D rendering skills, carpenters, and bicycle maintenance. 6:00 – 8:00 p.m. – Come out to Seven’s rooftop to meet nonprofits that are looking for people like you! All nonprofits have skill-based volunteer opportunities/board of director/advisory board openings. This a great way to learn how to get involved and meet other like-minded young professionals while soaking up some rays on a fantastic downtown rooftop. 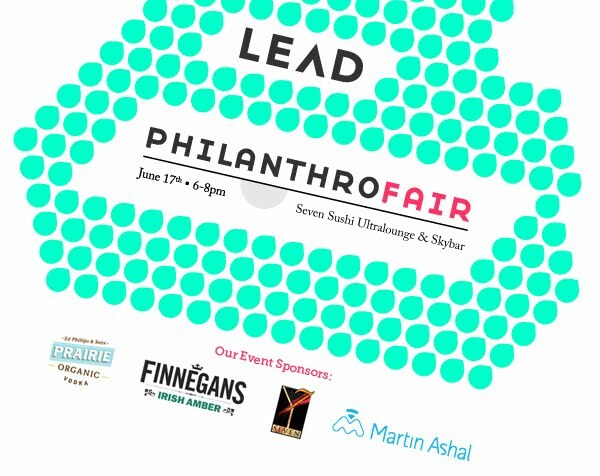 Meet Representatives from: LEAD, Smile Network, Women Venture, Women’s Advocates, Bolder Options, Youth Venture, Give Us Wings, Finnegans Community Fund, and the Juvenile Diabetes Research Foundation. We will also be auctioning some great items including a signed Adrian Peterson football and lower level tickets to the Oct. 17th Vikings/Cowboys game with pre-game field passes. 5:30 – 6:00 p.m. – Take the first step in creating a meaningful relationship with your community. The PhilanthroFair Mini Bootcamp is great for anyone who is curious about becoming a board member and wants to know the right questions to ask nonprofits at LEAD’s PhilanthroFair. In this quick 30-minute training, participants will learn board member roles and responsibilities, the unique differences between nonprofit and for-profit organizations, and what it takes to be an effective trustee. Ashoka's Change Your City Campaign: Twin Cities! I was honored to be interviewed for this Ashoka United States video as part of their "Change Your City" initiative. The Twin Cities are a pilot metropolitan area for this innovative campaign and there will be more to come in future months about this exciting work! Here's the video that local Minneapolis firm, Haberman, put together for the recent Ashoka Future Forum. You're invited, by the United Way Emerging Leaders, to join the Greater Twin Cities United Way for the first installment of their 2010 Leadership Speaker Series! An expert panel including representatives from Wilder Research, Women Venture, Rebuild Resources, and the United Way will explore how nonprofits affect business and the role they play in regenerating our local economy. See below for event details and register online for Nonprofits: Driving Economic Growth in the Twin Cities. June 22, 2010, 5:30-7:30 p.m.
United Way Emerging Leaders giving $500 or above. Series events are $20 for all others. Events are open to the public. Join NAAAP-MN to learn about how giving back in the community helps professionals to receive much more personally and professionally. 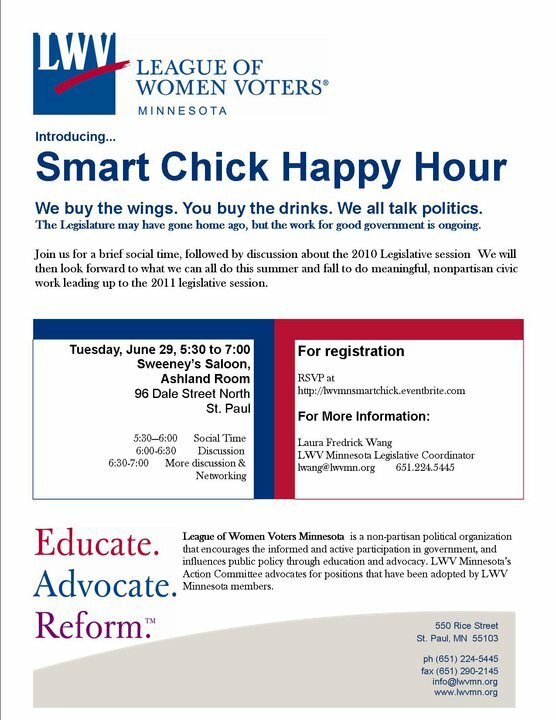 In 2009, Minnesota was bestowed the title of, "Most Civically Engaged State," by the National Conference on Citizenship, and the Twin Cities earned a reputation for having the highest rate of volunteers of any metropolitan area in the nation. These top scores are a result of the civic tradition and high level of civic engagement in Minnesota, something that newer immigrants also become engaged with and leaders in upon making their homes here in the state. This panel from across the civic sector will detail the strong level of engagement across Minnesota and provide inspiration and opportunities for helping keep Minnesota, and your career, on top! RSVPs requested to Diane at dtran@naaap-mn.org by Monday, June 7, 2010. Light refreshments will be provided. A Whole New World: Happy Birthday, Sara! 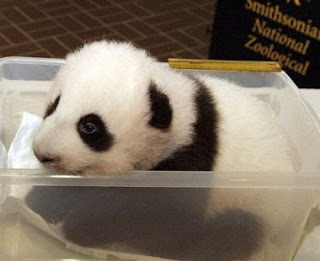 is in honor of our friendship and her love for pandas. What the world needs now . . .